I have to be honest that I didn't know that I was going to see the dolphins before I actually saw them in the water. I thought I was joining the group to go for "just" a boat ride. (Note to self: must get better at Spanish...or listening...or both.) The boat left from the port in Inirida and headed up river about 20 minutes before stopping at an inlet between an island and the shore. We waited about three minutes and then up popped at least two dolphins. It turns out that there are four species of fresh-water dolphins (five until recently when a Chinese dolphin was declared extinct). One of them, the Amazon River Dolphin, is found in several river systems in northern and central South America including the Inirida River. Having seen lots of dolphins while I lived in San Diego, they were instantly recognizable. 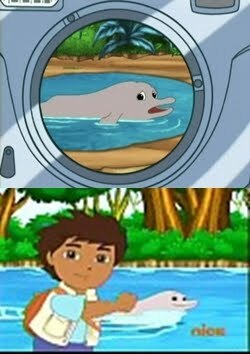 Compared to what I'm used to, they are lighter gray with a pink hue to them (they are sometimes called Pink Dolphins too) and instead of a fin they have a hump on their backs. If you look closely at this photo, you'll see that there are two dolphins next to each other. Two days later, I snapped a photo of these two nutrias (also known as perros de agua or water dogs) about five minutes down river from Inirida. They looked suspiciously like the seals you'd see in the ocean. Who'da guess that I'd run into dolphins and seals in a river in the middle of the South American jungle? I guess I'll need to catch up on my Dora and Diego shows so I'll know what to look out for...or maybe I'll just ask my sister. She seems to know a lot about this stuff. I've had my share of Dora and Diego and I could've helped you out with this one. I laughed all the way through this post! Funny!